Marcus Antonius (Latin: M•ANTONIVS•M•F•M•N) (c. January 14, 83 B.C.E. – August 1, 30 B.C.E. ), known in English as Mark Antony (also spelled Marc Anthony; Latin, Marcus Antonius), was a Roman politician and general. He was an important supporter of Gaius Julius Caesar as a military commander and administrator. After Caesar's assassination, Antony allied with Caesar’s adopted son Octavian and Marcus Aemilius Lepidus to form an official triumvirate which modern scholars have labeled the Second Triumvirate (43–30 B.C.E.). The triumvirate broke up in 33 B.C.E. Disagreement between Octavian and Antony turned to civil war in 31 B.C.E., after Antony formed a personal and political alliance with Queen Cleopatra VII of Egypt, and used her support to invade Parthia. Antony was defeated by Octavian at the naval Battle of Actium and then in a short land battle at Alexandria. He committed suicide, and Cleopatra killed herself soon afterwards. Mark Antony was especially criticized in Rome for betraying his Roman citizenship by forming an alliance with a foreign queen. His plans for collaboration between the Roman Empire and Greece were put to rest by his defeat at the Battle of Actium, and the Roman Empire continued a policy of attempting to bring its neighbors under central control for the next three centuries. Shakespeare made Antony and Cleopatra the subject of his famous tragedy, “Antony and Cleopatra,” and gave him a role delivering the funeral oration for Julius Caesar in another tragedy, Julius Caesar. A member of the Antonia gens, Antony was born in Rome, around 83 B.C.E. His was given the name of his father, Marcus Antonius Creticus, the son of the great rhetorician Marcus Antonius Orator, who had been executed by Gaius Marius' supporters in 86 B.C.E. His father was called Creticus because of his military exploits in Crete, and his grandfather was vividly portrayed as an orator in Cicero's De oratore. Through his mother, Julia Antonia, he was a distant cousin of Caesar. His father died at a young age, leaving him and his brothers, Lucius and Gaius, in the care of his mother, who married Publius Cornelius Lentulus Sura, a politician involved in and executed during the Catiline conspiracy of 63 B.C.E..
Antony's early life was characterized by a lack of parental guidance. According to historians like Plutarch, he spent his teenage years wandering the streets of Rome with his brothers and friends, Publius Clodius among them. That connection was eventually severed by a disagreement arising from his relations with Clodius's wife, Fulvia. While they were friends, they embarked on a wild life, frequenting gambling houses, drinking too much, and involving themselves in scandalous love affairs. Plutarch mentions the rumor that before Antony reached twenty years of age, he was already indebted the sum of 250 talents (equivalent to $165,000,000 USD). After this period of recklessness, Antony fled to Greece to escape his creditors and to study rhetoric. After a short time spent in attendance on the philosophers at Athens, he was summoned in 57 B.C.E. by Aulus Gabinius, proconsul of Syria, to take part in the campaigns against Aristobulus in Judea, and in support of Ptolemy XII in Egypt. In the ensuing campaign, he demonstrated his talents as a cavalry commander and distinguished himself with bravery and courage. It was during this campaign that he first visited Alexandria and Egypt. In 54 B.C.E., Antony became a member of the staff of Caesar's armies in Gaul and early Germany. He again proved to be a competent military leader in the Gallic Wars (54–53 B.C.E., 52–50 B.C.E. ), but his personality caused instability wherever he went. Caesar himself was said to be frequently irritated by his behavior. Nevertheless, in 51 B.C.E. he was raised by Caesar's influence to the office of quaestor, and was subsequently elected augur, and tribune of the plebs (50 B.C.E.). He defended the cause of his patron with great energy. Caesar's two ten-year commands as proconsul were expiring in 50 B.C.E., and he wanted to return to Rome for the consular elections. But the conservative faction of the Roman Senate (sometimes known as the Optimates), which was led by Gnaeus Pompeius Magnus and backed by his legions, demanded that Caesar resign his proconsulship and the command of his armies before being allowed to seek re-election to the consulship. Caesar refused to do this, as such an act would haveleft him a private citizen, and therefore open to prosecution for his actions while proconsul. In the interim between his proconsulship and his second consulship, it would also leave him at the mercy of Pompey's armies. Caesar's request was rejected, and Antony resorted to violent protest in the Senate which resulted in death threats against him. He fled Rome and joined Caesar, who had led his armies to the banks of the Rubicon, the river that marked the southern limit of his proconsular authority. With all hopes of a peaceful solution for the conflict with Pompey gone, Caesar led his armies across the river into Italy and marched on Rome, starting the last Republican civil war. After a long political and military struggle, between 49 and 45 B.C.E., which involved battles in Italia, Greece, Egypt, Africa, and Hispania, Caesar finally defeated the last of the traditional faction of the Roman senate at the Battle of Munda and became dictator. Caesar's civil war and the resulting changes in Roman government all but swept away the political traditions of the Roman Republic, eventually leading to the establishment of the Roman Empire. During the civil war, Antony was Caesar's second in command. In all the battles against the Pompeians, Antony commanded the left wing of the army, a proof of Caesar's confidence in him. When Caesar became dictator, Antony was made Master of the Horse, the dictator's second-in-command, and in this capacity remained in Italy as administrator in 47 B.C.E., while Caesar was fighting the last Pompeians, who had taken refuge in the African provinces. Antony was far less competent as an administrator than he had been as general, and he seized the opportunity to indulge in the most extravagant excesses, depicted by Cicero in the Philippics. In 46 B.C.E. he seems to have taken offense because Caesar insisted on payment for the property of Pompey, which Antony professed to have purchased, but had in fact simply appropriated. Conflict soon arose, and, as on other occasions, Antony resorted to violence. Hundreds of citizens were killed and Rome herself descended into a state of anarchy. Caesar was displeased with the whole affair and removed Antony from all political responsibilities. The two men did not see each other for two years. The estrangement did not last long, however; in 45 B.C.E. Antony met the dictator at Narbo, and rejected Trebonius' suggestion that he should join in a conspiracy against Caesar. The two were reconciliation by 44 B.C.E., when Antony was chosen as partner for Caesar's fifth consulship. Whatever conflicts existed between the two men, Antony remained faithful to Caesar at all times. On February 15, 44 B.C.E., during the Lupercalia festival, Antony publicly offered Caesar a diadem. This event was fraught with meaning: a diadem was the symbol of a king, and in refusing it, Caesar indicated that he did not intend to assume the throne. On March 14, 44 B.C.E., Antony was alarmed by a conversation he had with a Senator named Casca, who told him the gods would make a strike against Caesar in the Roman Forum. The next day, fearing the worst, he went to prevent the dictator from entering the Forum. The Liberatores reached Caesar first, however, and he was assassinated on March 15, 44 B.C.E., the date known as the Ides of March. In the turmoil that surrounded the event, Antony escaped Rome dressed as a slave, fearing that Caesar’s assassination would precipitate a bloodbath among his supporters. When this did not occur, Antony quickly returned to Rome and negotiated a truce with the assassins' faction. Antony, as consul, appeared to pursue peace and the end of the political tension, and following a speech by Cicero in the Senate, it was agreed to grant amnesty to the assassins. On the day of Caesar's funeral, while giving the eulogy, Antony accused the conspirators of murder, ensuring a permanent breach with Marcus Brutus and Cassius. Antony snatched the toga from Caesar's body to show the crowd the stab wounds, pointing at each wound and naming the perpetrators. During the eulogy he also read Caesar's will, which left most of his property to the people of Rome, demonstrating that, contrary to the conspirator's assertions, Caesar had no intention of forming a royal dynasty. Public opinion turned, and that night, the Roman populace attacked the assassins' houses, forcing them to flee for their lives. Antony surrounded himself with a bodyguard of Caesar's veterans, and in June he forced the senate to grant him a five-year governorship of the provinces of northern and central Transalpine Gaul (Gallia Coata) and of Cisalpine Gaul, which was then administered by Decimus Junius Brutus Albinus, one of the conspirators. Brutus refused to surrender the province, and Antony set out to attack him in October 44 B.C.E. Despite Antony’s growing popularity, from September of 44 to April of 43 B.C.E., the orator Cicero delivered a series of speeches in the Senate attacking him. Gradually, Octavian, Caesar’s 19-year-old great-nephew and adopted son, emerged as a rival. Antony was now besieging Decimus Brutus at Mutina. Encouraged by Cicero, the Senate granted Octavian imperium (commanding power), legalizing his command of troops, and sent him to relieve the siege, along with Hirtius and Pansa, the consuls for 43 B.C.E. In April 43, Antony's forces were defeated at the Battles of Forum Gallorum and Mutina, forcing Antony to retreat to the southern part (Narbonensis) of Transalpine Gaul. Both consuls were killed during the fighting, leaving Octavian in sole command of their armies. The senate attempted to give command of the consular legions to Decimus Brutus, but Octavian refused to surrender them. In July, an embassy from Octavian entered Rome and demanded that he be given the consulship. When this was refused, he marched on the city with eight legions. He encountered no military opposition, and was elected consul along with his relative, Quintus Pedius. Meanwhile, Antony had formed an alliance with another of Caesar’s former Masters of the Horse, Marcus Aemilius Lepidus, and other former supporters of Caesar. In October, when they heard that Marcus Junius Brutus and Gaius Cassius had assembled an army in Greece in order to march on Rome, Antony, Octavian and Lepidus met in Bononia (Bologna), and entered into an official five-year autocratic pact, the Second Triumvirate (November, 43 B.C.E.). Their enemies, including the orator Cicero, were proscribed and executed. Brutus and Cassius were defeated after two battles at Philippi in Macedonia, and committed suicide ( 42 B.C.E.). After the battle, a new agreement was made among the members of the Second Triumvirate: while Octavian returned to Rome, Antony went to Egypt where he allied himself with Queen Cleopatra VII, a former lover of Julius Caesar and mother of Caesar's infant son, Caesarion. Lepidus became governor of Hispania and the province of Africa. 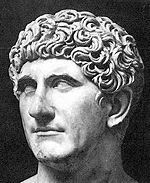 Early in 40 B.C.E., Mark Antony received news that his brother Lucius Antonius, with Antony’s third wife Fulvia, had unsuccessfully revolted against Octavian and set off the Perusine War; and that the eastern neighbors of the Roman Empire, the Parthians, had invaded Roman Syria. Antony went to Italy and reconciled with Octavian at Brundusium (Brindisi). Fulvia had died in the meantime, so Antony further strengthened their alliance by marrying Octavian’s sister, Octavia. Antony and Octavian decided to encourage Herod, who had fled from Judaea to escape the Parthians and their Jewish allies, to retake the country and become its king. In 39 B.C.E. they concluded the short-lived Treaty of Misenum with Pompey's son Sextus Pompeius, who held control of wide areas of the Mediterranean and had been pirating Roman ships. In 39 B.C.E., accompanied by Octavia, Antony sailed to Greece, where he behaved in a most extravagant manner, assuming the attributes of the god Dionysus. The rebellion in Sicily of Sextus Pompeius kept the army promised to Antony in Italy, and Antony and Octavian quarreled once more. With the help of Octavia, a new treaty was signed in Tarentum in 38 B.C.E., renewing the triumvirate for a period of another five years (ending in 33 B.C.E. ), and Octavian again promised to send legions to the East. Antony, however, was doubtful of Octavian’s support of his campaign against Parthia. From Corcyra (modern Corfu, or Kérkira), he sent Octavia, pregnant with her second child Antonia, back to Rome, and arranged for Cleopatra, now the mother of his twins, to join him in Syria. Cleopatra was hopeful that Antony would help her to re-establish the old boundaries of the Ptolemaic kingdom, and Antony needed money and supplies from Egypt to support his planned attack on Parthia. The couple remained together for the rest of Antony’s life. Religious propaganda declared Cleopatra the New Isis, or Aphrodite, to Antony’s New Dionysus. Cleopatra loaned Antony the money he needed for his army. In 38 B.C.E., Antony's lieutenant, Publius Ventidius, won a decisive victory over the Parthians, and after capturing Jerusalem and surrounding areas in 37 B.C.E., he established Herod the Great as king of Judaea. After invading Cilicia and Syria, Antony invaded the Parthian Empire with an army of one hundred thousand legionnaires. The campaign proved a disaster. After a series of defeats in battle, Antony lost most of his army in 36 B.C.E. during a retreat through Armenia in the peak of winter. Meanwhile, in Rome, the triumvirate was no more. Lepidus had been forced to resign after an ill-judged political move, leaving Octavian in power. Octavian married Livia and began to win the traditional Republican aristocracy to his side, attacking Antony in order to strengthen his own position. He accused Antony of immorality for abandoning his faithful wife in Rome with their children, in order to comport with the queen of Egypt. Antony was accused of betraying his Roman citizenship by associating with a foreign woman. Several times Antony was summoned to Rome, but remained in Alexandria with Cleopatra. In 34 B.C.E., again with financial support from Egypt, Antony invaded Armenia, this time successfully. He celebrated his return to Alexandria with triumphal procession through the streets, regarded by Romans as an impious parody of their traditional Roman Triumph. A few days later, he summoned to hear a proclamation, the Donations of Alexandria, which caused a final breach in Antony’s relations with Rome. Cleopatra was proclaimed Queen of Kings and Queen of Egypt, to rule with Caesarion (Ptolemy XV Caesar, son of Julius Caesar), King of Kings and King of Egypt. Most important, Caesarion was declared legitimate son and heir of Caesar. Antony distributed kingdoms among his children: Alexander Helios was named king of Armenia and Parthia (which was never conquered by Rome), his twin Cleopatra Selene received Cyrenaica and Libya, and the young Ptolemy Philadelphus was awarded Syria and Cilicia. The acknowledgement of Cleopatra’s son Caesarion as legitimate heir to Caesar's name was a serious threat to Octavian, whose status as Caesar’s adopted son guaranteed him popularity and the loyalty of the legions. During the year of 33 B.C.E., the Roman leaders directed unprecedented, savage propaganda attacks against each other, including the production by Octavian of a document, supposedly a will drawn up by Antony, which favored the children of Cleopatra and provided for his own burial at Alexandria. Antony (in Egypt) divorced Octavia and accused Octavian of being a social upstart, of usurping power, and of forging the adoption papers by Caesar. Octavian responded with treason charges accusing Antony of illegally keeping provinces that should have been distributed to other men by lots, as was Rome's tradition, and of starting wars against foreign nations (Armenia and Parthia) without the consent of the Senate. Antony was also held responsible for Sextus Pompeius' execution without trial. The triumvirate expired on the last day of 33 B.C.E. and was not renewed, though Antony continued to mint coins calling him "Triumvir." In 32 B.C.E., the Senate deprived Antony of his powers and declared war against Cleopatra. Both consuls (Gnaeus Domitius Ahenobarbus and Gaius Sosius) and a third of the Senate abandoned Rome to meet Antony and Cleopatra in Greece. In 31 B.C.E., war started. Antony successively established military headquarters at Ephesus (Selçuk), Athens, and Patras (Pátrai) and marshaled his principal fleet in the gulf of Ambracia (northwestern Greece), with more naval detachments stationed at a long line of posts along the west coast of Greece. Octavian's loyal and talented general Marcus Vipsanius Agrippa sailed across the Ionian Sea and captured the Greek city and naval port of Methone, loyal to Antony. The popularity of Octavian with the legions secured the defection of the provinces of Cyrenaica and Greece to his side. As Antony lost ground, the morale of his forces deteriorated. Cleopatra further aggravated the situation by insisting on being present at his military headquarters, against the wishes of many of his Roman supporters. On September 2, 32 B.C.E., at the naval Battle of Actium, Antony and Cleopatra's navy was destroyed, and they were forced to escape to Egypt with 60 ships which broke through enemy lines. It was nearly a year before Octavian reached them there, but soon after his arrival, when resistance proved impossible, first Antony and then Cleopatra committed suicide (August 30 B.C.E.). Octavian did not let matters rest. In August, assisted by Agrippa, he invaded Egypt. When resistance proved impossible, and with no other refuge, Antony committed suicide by falling on his sword in the mistaken belief that Cleopatra had already done so (30 B.C.E.). A few days later, Cleopatra committed suicide. Her servants, Iras and Charmion, also killed themselves, and Caesarion was murdered. Antony's daughters by Octavia were spared, as was his son, Iullus Antonius. His elder son, Marcus Antonius Antyllus, was killed by Octavian's men while pleading for his life in the Caesarium. When Antony died, Octavian became uncontested ruler of Rome. In the following years, Octavian, who was known as Augustus after 27 B.C.E., managed to personally take on all administrative, political, and military offices. When Augustus died in 14 C.E., his political powers passed to his adopted son Tiberius; the Roman Principate had begun. The rise of Caesar and the subsequent civil war between his two most powerful adherents effectively ended the credibility of the Roman oligarchy as a governing power and ensured that all future power struggles would be determined by which individual could achieve supreme control of the government, rather than which individual(s) could gain the support of the Senate. Mark Antony, as Caesar's key adherent and one of the two men around whom power coalesced following his assassination, was one of the three men chiefly responsible for the fall of the Roman Republic. Mark Antony was a leader of considerable ability, an astute politician and a competent general, although he lacked Octavian’s exceptional efficiency and energy, and several times seemed unable to grasp the moment for action. Since Octavian ultimately proved victorious in the struggle to dominate Rome, it is primarily Octavian’s interpretation of events that has entered the historical records. Cicero, an opponent of Caesar, used all his ability as an orator to depict Antony as a drunken, lustful debauchee, and this too has become a historical record. Octavian’s victory in the naval battle off Actium ensured that his policy of Roman dominance remained dominant for the next three centuries, and Antony’s plans for a collaboration between Greece and Rome were not given a trial until the emperor Constantine captured Byzantium. Shakespeare made Antony and Cleopatra the subject of his famous tragedy, “Antony and Cleopatra,” and gave him a role delivering the funeral oration for Julius Caesar in another tragedy, Julius Caesar. Antony had been married in succession to Fadia, Antonia, Fulvia and Octavia, and left behind him a number of children. Through his daughters by Octavia, he became ancestor to the emperors Caligula, Claudius, and Nero. Marriage to Antonia Hybrida (his paternal first cousin). According to Plutarch, Antony threw her out of his house, because she slept with his friend, the tribune Publius Cornelius Dolabella. Antony divorced her, before he married Fulvia. Marcus Antonius Antyllus, executed by Octavian in 30 B.C. 38 B.C.E.—Treaty of Tarentum: Triumvirate renewed until 33 B.C.E. Martin, Paul M. 1990. Antoine et Cléopâtre: la fin d'un rêve. Paris: Albin Michel. Plutarch, John Dryden; Snodgrass, Neil Smith. 1900. Plutarch and Shakespeare. New York: E. P. Dutton. Plutarch, John Dryden; Clough, Arthur Hugh; Bond, Raymond Tostevin. 1962. Everybody's Plutarch, Arr. and edited for the modern reader from the "Parallel lives". New York: Dodd, Mead. Orations: The fourteen Philippics against Marcus Antonius ~ Tufts University Classics Collection. Plutarch's Parallel Lives: "Antony" ~ Internet Classics Archive (MIT). Plutarch's Parallel Lives: "Life of Antony" - Loeb Classical Library edition, 1920. Plutarch's Parallel Lives: "The Comparison of Demetrius and Antony" ~ Internet Classics Archive (MIT). This page was last modified on 15 August 2018, at 16:00.